This large 2nd floor room in a 1934 home in the West University neighborhood of Houston was home to two boys, who took it on a 20+ year ride through crayons, toy cars, sports, school projects, first dates, college entrance forms, and professional careers. Now that the sons are grown and gone, Mom is calling the room her own. 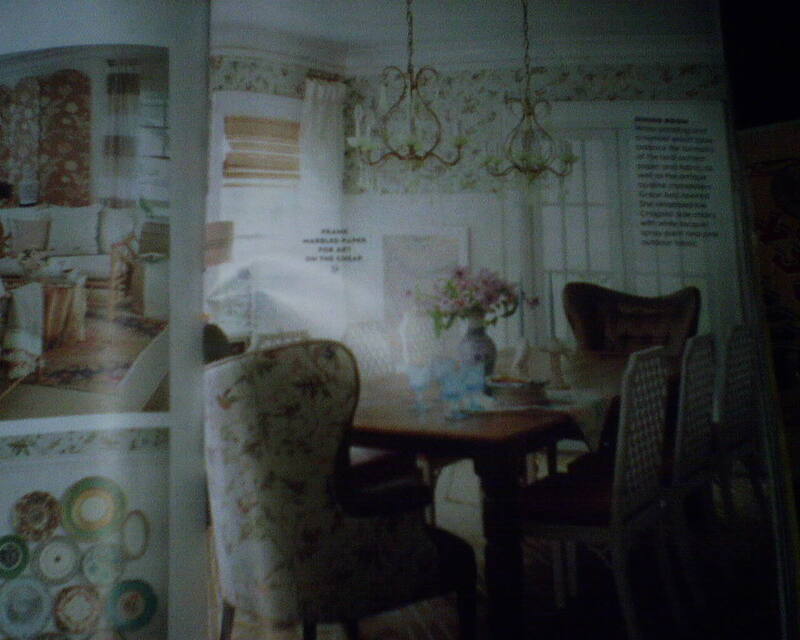 She got rid of the dorm look and is going for something calming and sophisticated, with a farm-house twist. 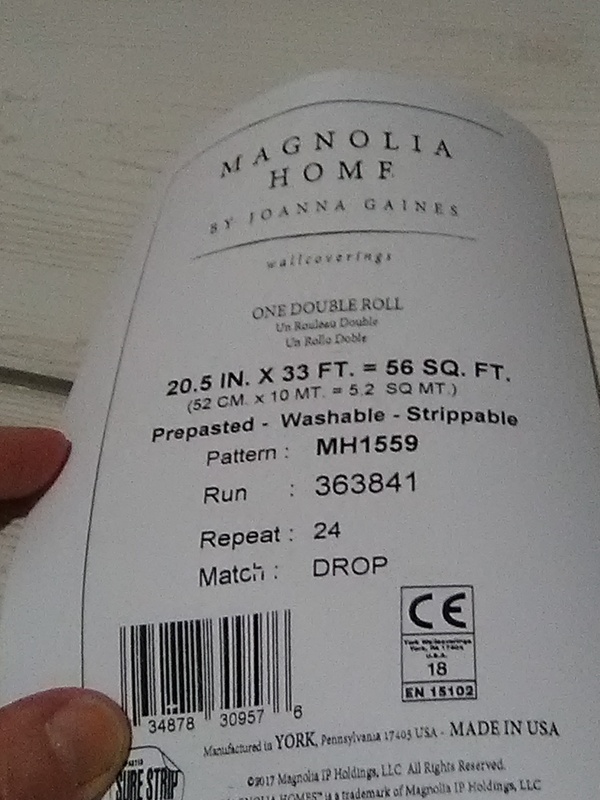 On the ceiling, I hung wallpaper that looks like ship-lapped wood… Joanna Gaines “Magnolia” book by York, in their SureStrip line. 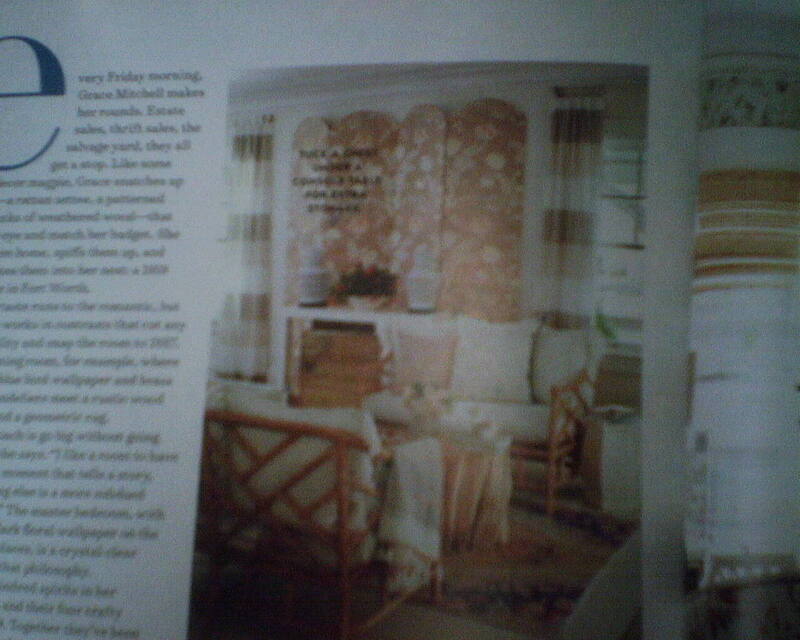 To augment that, the homeowner chose another York pattern, this soft brown / charcoal linen weave stringcloth. It’s a textured material that resembles the fabric of a man’s tailored suit. It’s beautiful with the wood plank look on the ceiling, and creates a snug, cozy feel in the large room. I wasn’t happy with the quality of the product. See my previous post about the mismatches at the seams. In addition, the material was thick and difficult to trim, and difficult to turn around corners. But worse, whatever backing the manufacturer used sucked up paste like the dickens. I pasted the back and booked according to directions. Yet when I went to hang a strip, it didn’t want to stick to the wall. 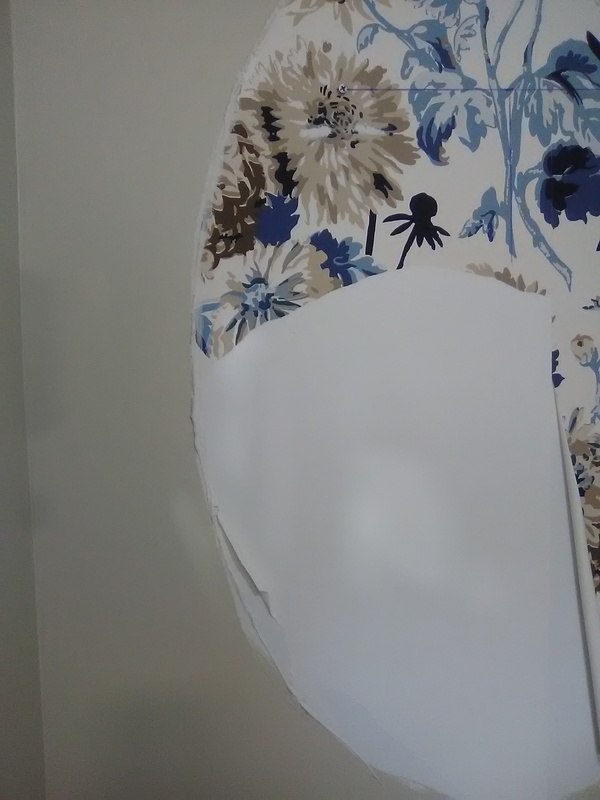 There was virtually no paste on the back … it had all been sucked up into the backing, leaving little on the surface to hold the strip onto the wall. The strips also had a lot of memory, and wanted to keep curling up. Although the instructions said the substrate was paper, I believe it was a non-woven material. That means it was dimensionally-stable and didn’t need to book or sit for any period after pasting. I tried various installation techniques and finally settled on lightly misting the back of each strip with water , rolling it up and letting it sit for a few minutes while I rolled paste onto the wall (not the back of the paper). Then I applied the paper to the wall. The misting relaxed the paper and stopped the curling, and also made the material more pliable. Pasting the wall made sure that paste was there to hold the paper to the wall, instead of letting the thirsty substrate soak it all up. Even so, this has been a difficult install. The paper is thick and hard to trim, and there are issues with the seams that do not make me happy (see yesterday’s post). I worked an 8-hour today and only got two walls done. So I have to go back tomorrow, and the job will take a day longer than I had planned for. 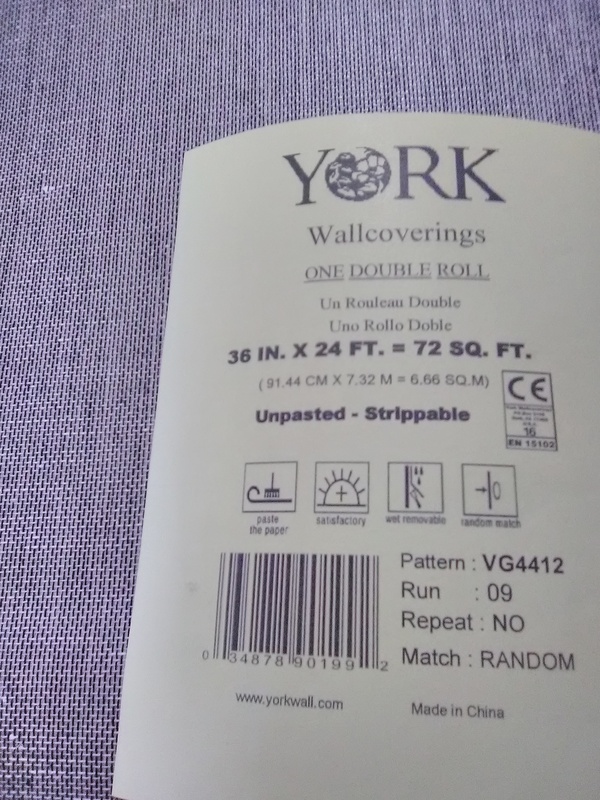 The wallcovering is made by York. I usually like their products, but, like I said, I am a bit displeased with this stuff. The homeowner, however, loves it. This large bedroom in an addition to a 1934 home in the West U neighborhood of Houston wasn’t actually a dormitory, but it was home to two boys throughout their childhood. 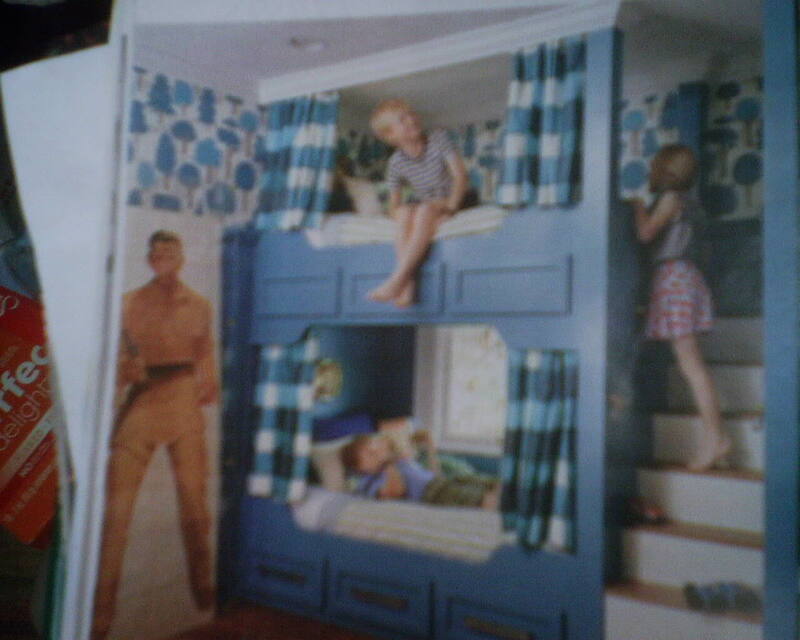 Now that the boys are grown and gone, the homeowner wants to make this into a spare bedroom that feels snug, yet chic. She’s going for something of the Farmhouse Modern look. 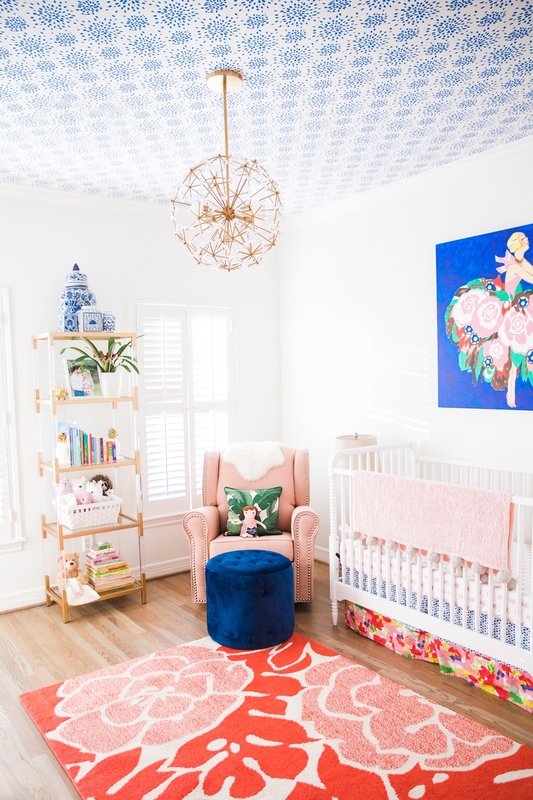 Instead of shiplapped wood on the ceiling, she chose wallpaper that mimics the look – and is much more affordable. 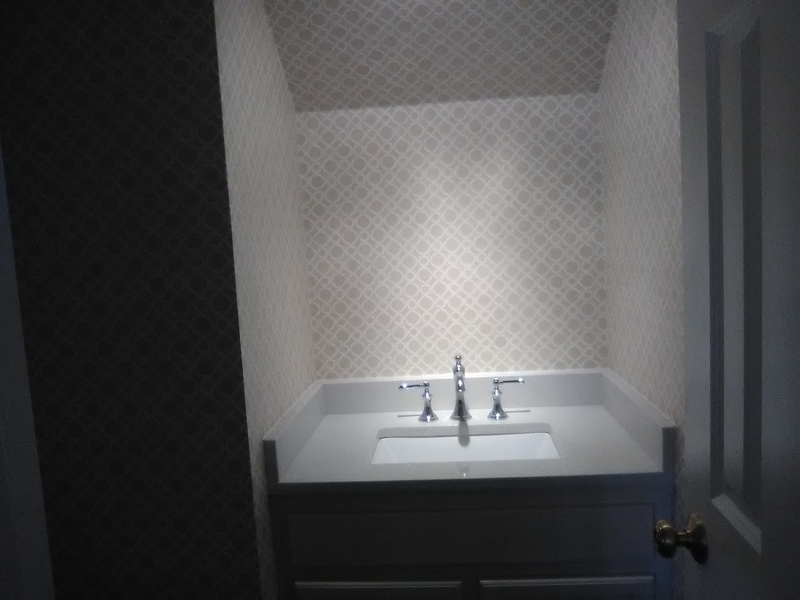 This wallpaper is by York, in their Joanna Gaines “Magnolia” line. 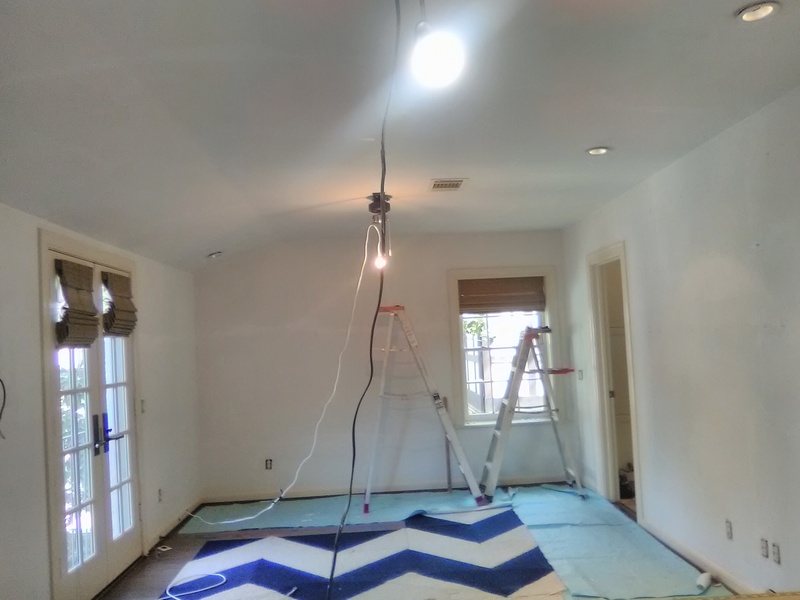 It is a pre-pasted light non-woven material in their SureStrip line, and is designed to strip off the wall easily and in one piece when it’s time to redecorate. I like this product a lot. And today I appreciated its extra strength, because I did have to reposition the first two strips quite a bit. 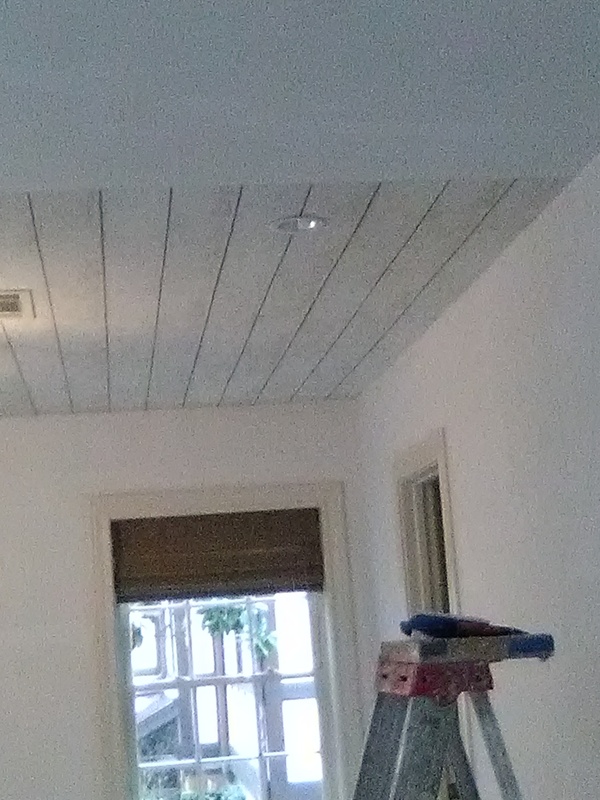 I’m running the strips across the ceiling the short way, from right to left (see top photo). This means that the brown stripes that represent the gaps between the wood planks will run parallel to the long wall you see on the right of the photo. Theoretically, I should have been able to line the paper up along that far wall. The problem became quickly apparent, though – that the two walls (all four walls, in fact) were woefully out of square with one another. That meant that if the paper was hung parallel to the far wall, the brown line would go off-track as it moved across the long wall on the right. My first strip, hung parallel to the far wall, was so out of wack with the wall on the right, that I knew that if I continued, that brown line would march very off-parallel away from the wall on the right. That is a 34′ long wall, and very visible when you are standing in the room, so it was important to keep the brown line as parallel as possible. This would have been easy if my strips had been running parallel to the wall. But since I was running the paper in the other direction across the ceiling (perpendicular to the long wall), it was very difficult. I pulled the first strip off the wall, repasted it lightly to keep the paste activated, put it in a plastic trash bag to keep it damp, and took a new tack. The distance between the “boards” was 6″. I wanted the first row of boards to look as wide as the other boards, but I needed some play in order to accommodate irregularities in the wall on the right, as well as potential tracking off-kilter. So I decided to have the brown line fall 5″ away from the long wall. That left this row of “boards” only an inch narrower than they should have been, which would not be very noticeable to the eye. I took a ruler and measured 5″ out from the long wall on the right. Then I took a straightedge and drew a line connecting the marks, to give me a guide line that was parallel to the long wall. Because the long wall was not nearly straight, this line was not exactly 5″ from the wall in every spot. But it was good enough to serve as a guideline for where I wanted my brown line to fall. Then I went and got that first strip of paper that had been cooling its heels in the plastic bag, along with Strip No. 2, and got them onto the wall. I used my pencil line as a guide to position that brown line. Since you can’t get a very accurate placement with just one 20.5″ wide strip of wallpaper, having the two strips together helped to ensure that the brown line was running along the pencil line. Still, I had to remove and reposition both strips several times, until I got them on my target. All this is hard enough when you’re working on a wall, but on a ceiling, without the help of gravity holding your paper in place and keeping it free of twists and wrinkles, plus that same gravity trying to pull the paper down around your head, it was quite the feat. But once I got those two initial strips properly positioned and smoothed, the subsequent strips followed nicely, and the brown line marched along the pencil line beautifully. 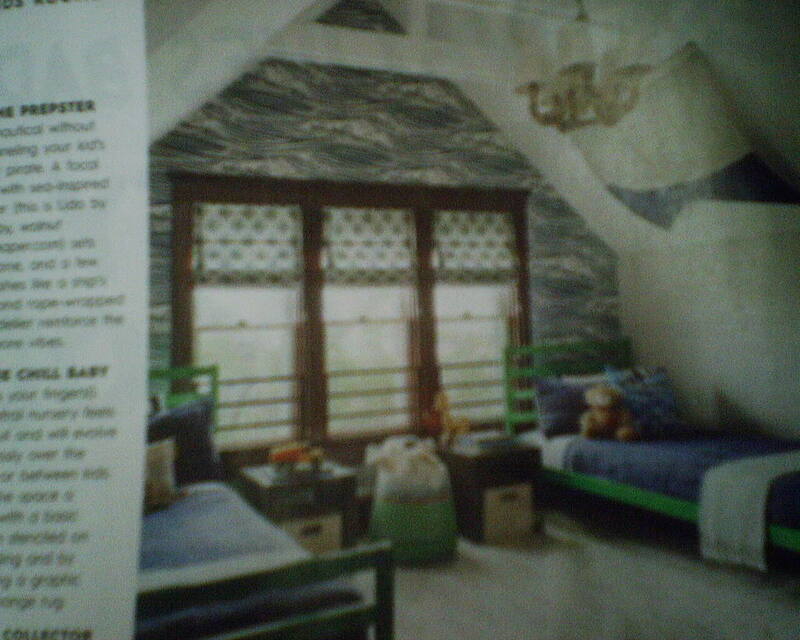 I don’t like stopping in the middle of a wall, because wallpaper goes up better when you put a wet strip next to a wet strip, and they can be manipulated together at the seams. But this is a large room, and I wanted to get as much done as possible, to shorten the time needed when I come back later to finish. The vendor promises that they will supply the same run number. 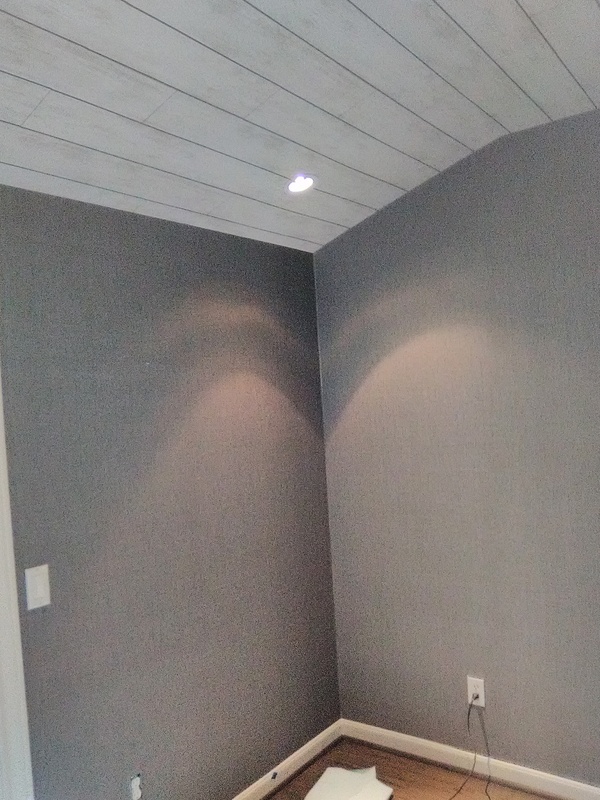 The next post on this room will show the finished ceiling, as well as a thin, tailored, textured woven fiber in chocolate brown that is going on the walls. 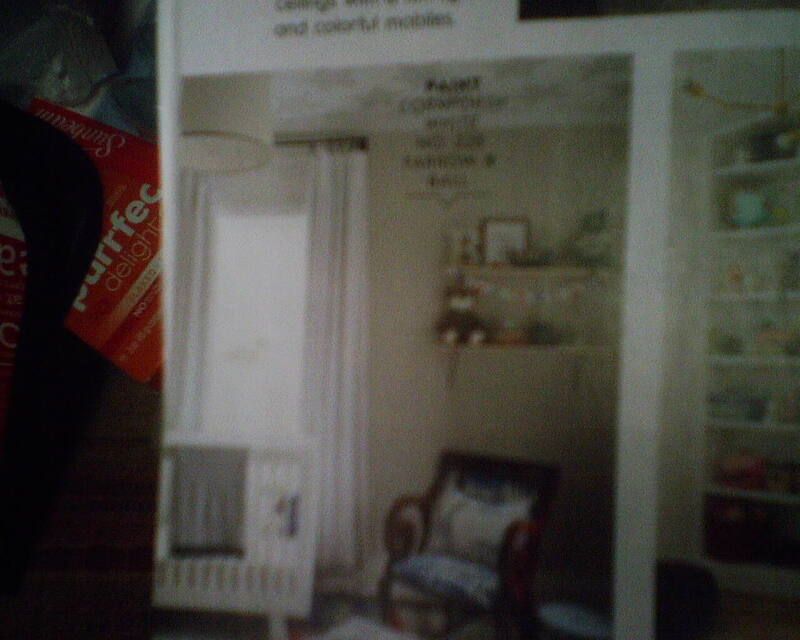 As a side note, I have worked in this home for this lovely family several times years ago. The last time I was here, their daughter was an infant. I asked how she was doing today, and was told that, “She’s out running errands, driving Mom’s car.” !! 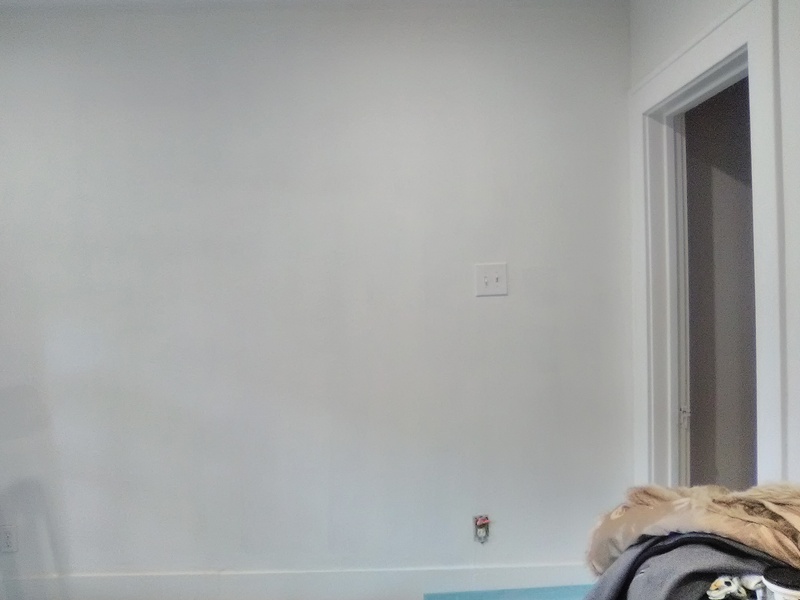 A finished picture of a room I did about a year ago. A new baby will soon be welcomed into the home of this young couple in the Houston Heights neighborhood called Norhill (or Woodland Heights). 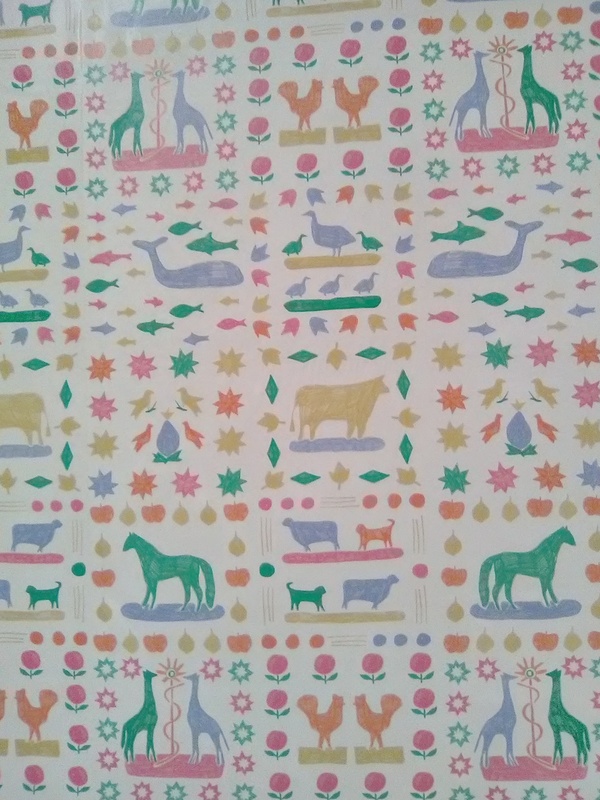 Mom wanted something gender-neutral, and found this colorful and adorable shapes-and-animals-in-blocks print on line at Lulie Wallace. 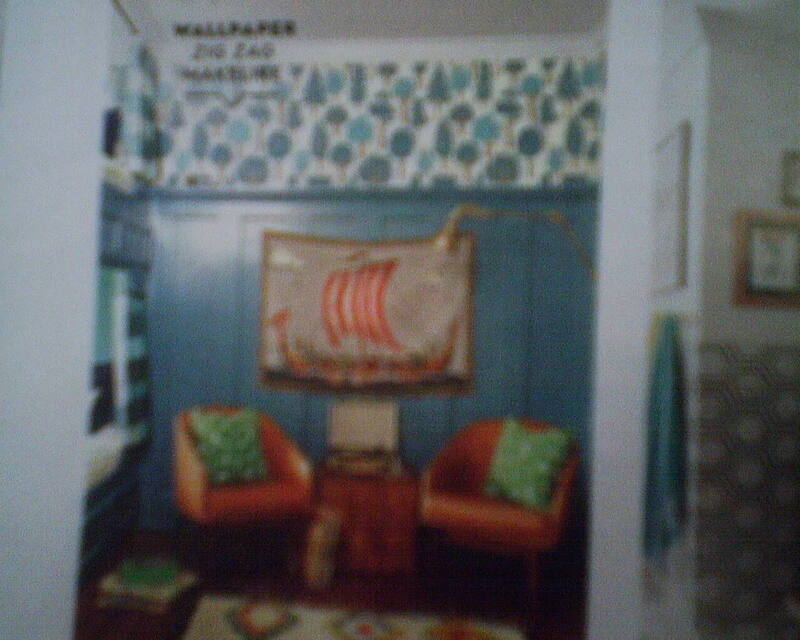 This went on just one accent wall of the room, but it is tame enough that it would work OK if put on all four walls. I skim-floated the walls first, to smooth out the light texture on them, then followed with a primer coat of Gardz. This wallpaper is a bit atypical, because it is pre-pasted, which means it comes with a thin layer of paste on the back that you activate with water (instead of having to roll paste on the back of every strip). I do like the pre-pasted papers. I do roll a light coat of paste on the wall, to augment the manufacturer’s pre-paste. Another dissimilarity is that the paper comes packaged in individual strips, rather than traditional rolls with several strips rolled up together. Even more unusual is that the strips were meant to be overlapped, instead of butted together. Overlapping the seams creates a vertical ridge under the paper which is somewhat visible. You also have to have an adhesive that will stick to the acrylic coating on top of the paper. There are some good aspects to overlapping seams. For one, this makes for a very strong bond. For another, it takes stress of drying and shrinking paper off the seam and distributes it across that 3/4″ of overlapped area. 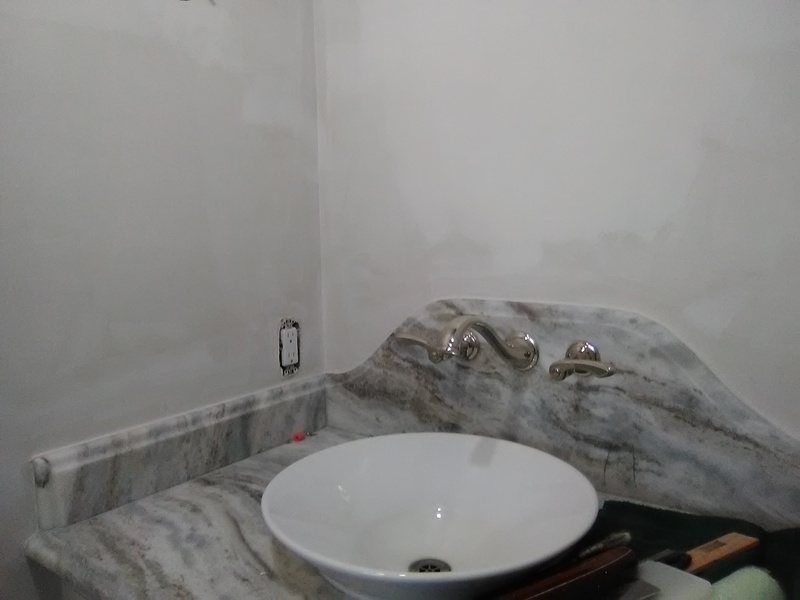 In this 80-year-old house, with it’s many layers of paint with a history of not sticking to each other, this is important, because it greatly reduces the chances of the tension on the seams causing the paint layers to come apart, which would cause gapping at the seams. See previous post. 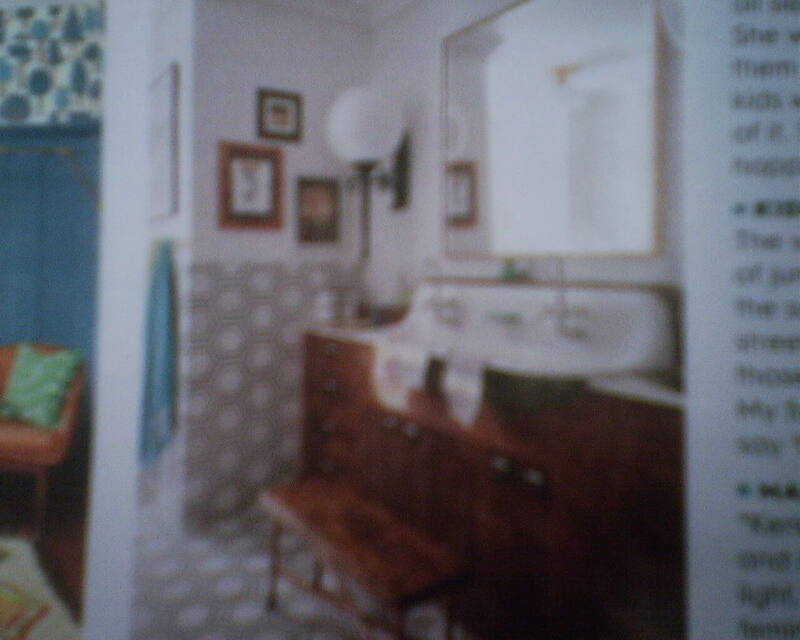 Another positive feature about overlapping the seams, and how that worked with this particular pattern, is that, in this 1930 home, with its unlevel ceiling and floor and its greatly-out-of-plumb walls, I was able to manipulate the strips of wallpaper so that they looked straight and plumb – even though they were actually hung quite off-plumb. 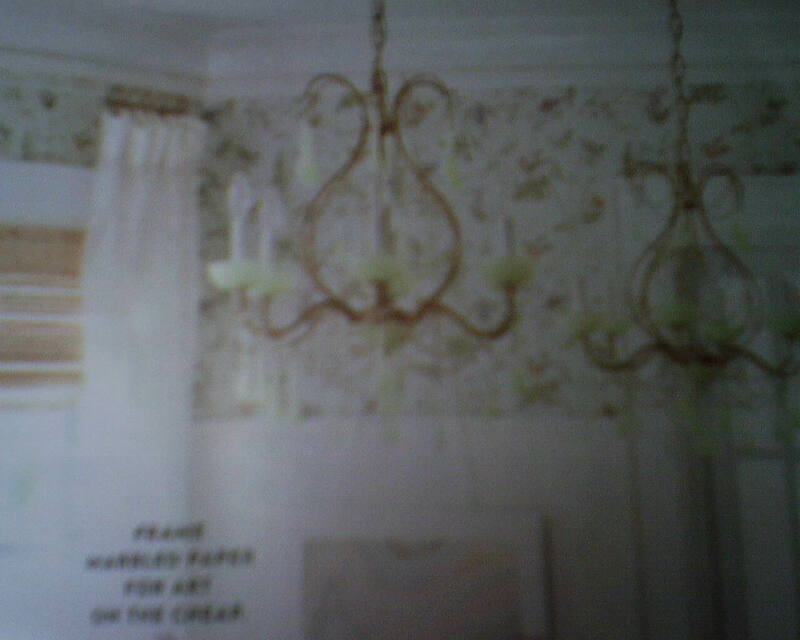 This wallpaper pattern is by Lulie Wallace, and was bought on line. 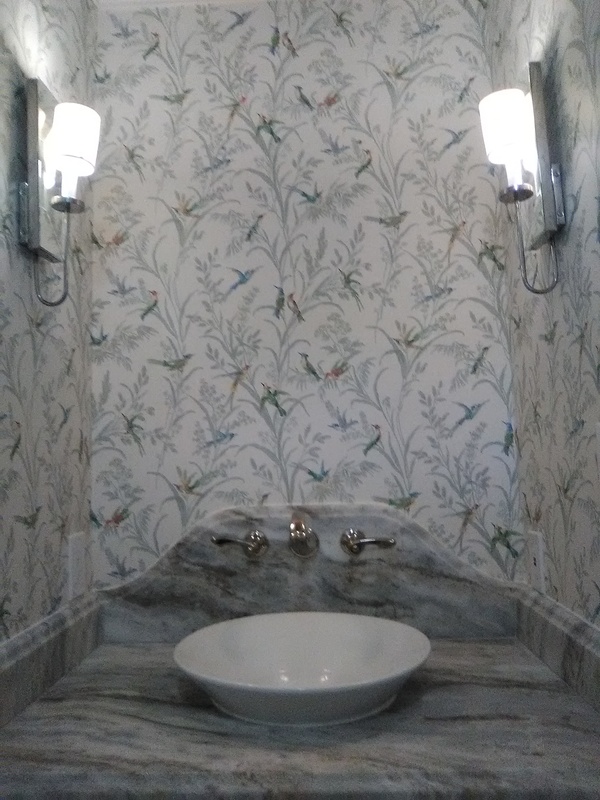 The homeowner loved the “Longwood” pattern originally in her powder room (see a snippet of it in the second photo), but, after going through the flooding from Hurricane Harvey, she worried that putting the same paper in her renovated bathroom would remind her of the horrible storm. So she decided to tame things down a little, and went with this “Augustine” pattern by the same company. 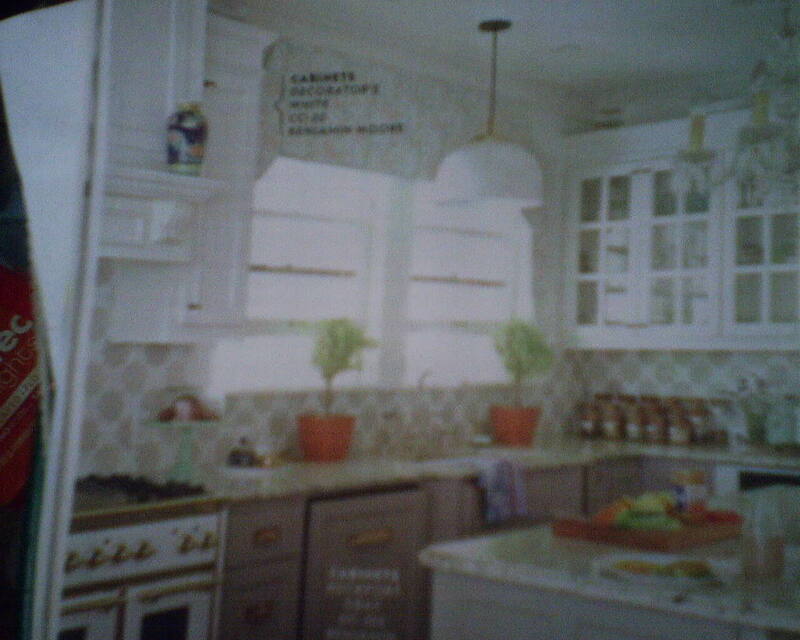 She chose this muted colorway (it’s a tad brighter in person than in my photos) partly because the greens in the paper melded nicely with her marble countertop, and also because the blues looked great with her blue ceiling (which was chosen to go with the original Longwood design). 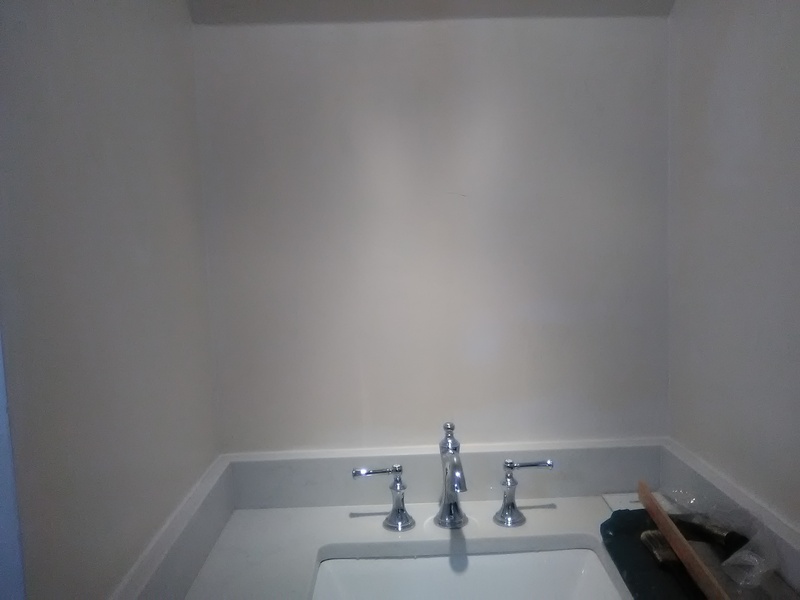 The contractors did a reasonably good job prepping the walls. 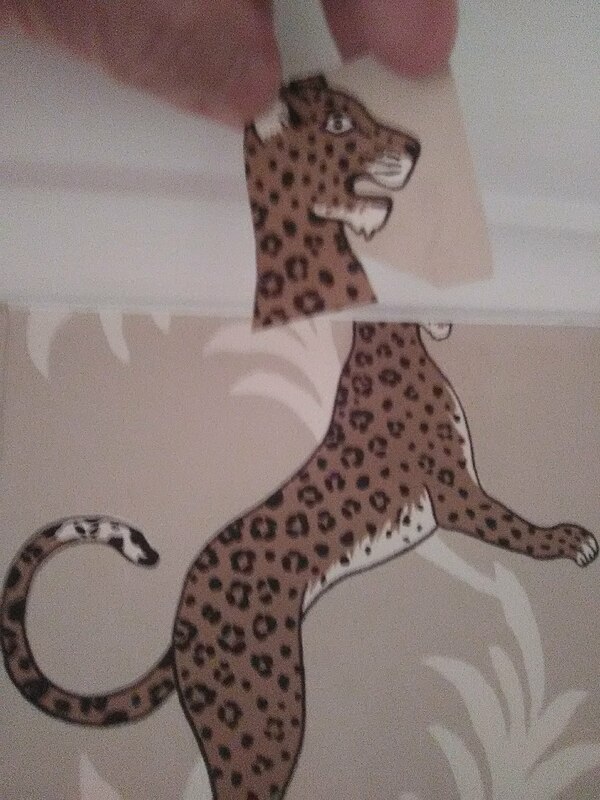 However, they painted over the old wallpaper, which is not a good idea. 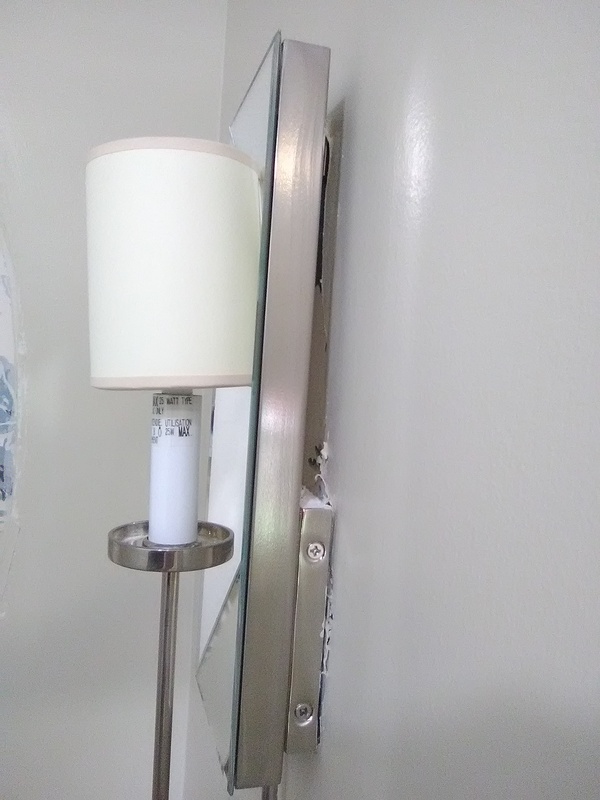 They also didn’t bother to remove the mirror or light sconces when they applied their smoothing compound, and you can see remnants of white gunk under the oval where the mirror hung and by peeking behind the light fixture. These were small things, but it took me two hours to smooth over these areas, get to dry, sand, and then prime. 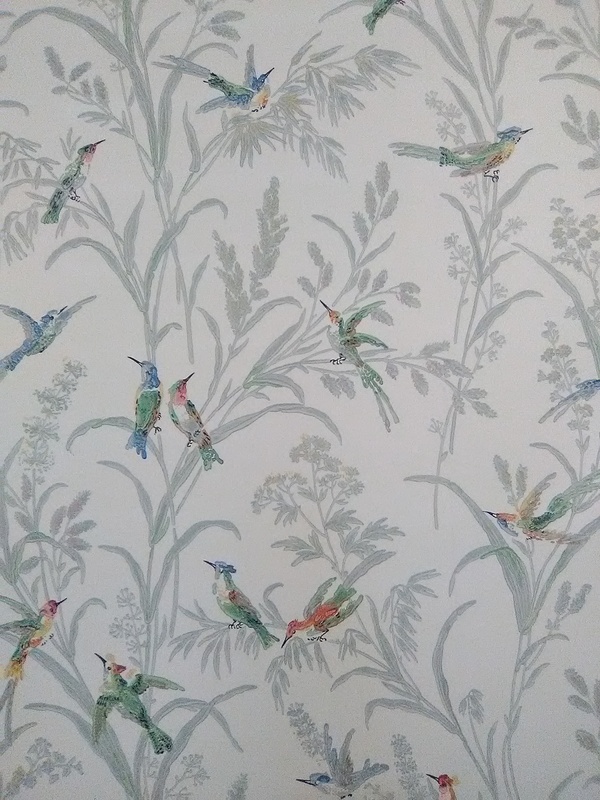 The new Augustine humming bird pattern is one of my all-time favorites. It’s a very old, historic design. 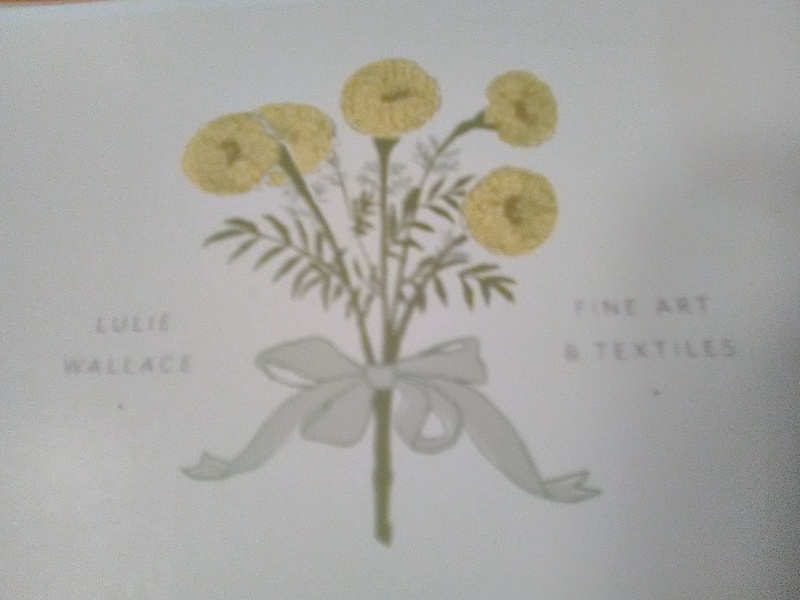 I love the design, and the paper is wonderful to work with. It is pre-pasted, so goes up more quickly than papers that have to be pasted by hand. It is easy to manipulate around turns, it doesn’t tear easily, it is thin and hugs the wall tightly, it dries quickly, and it has a lovely “raised ink” texture. 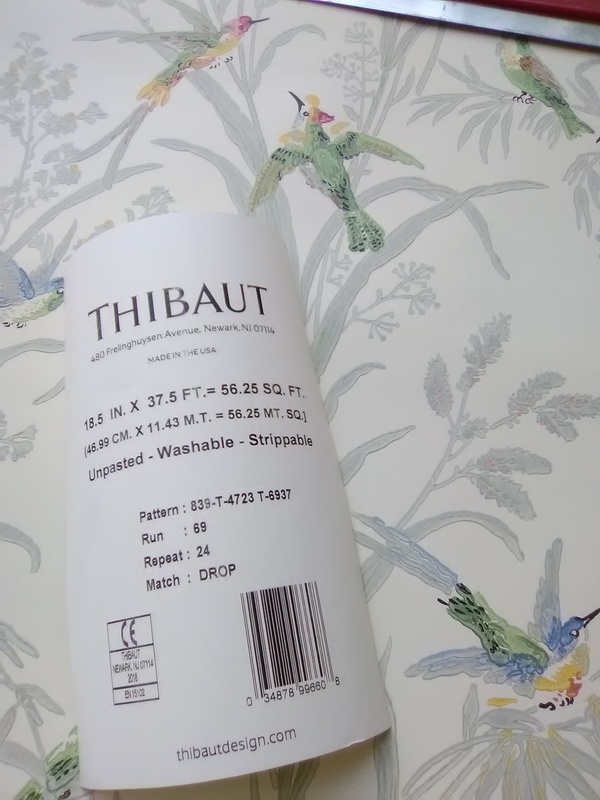 This paper is by Thibaut, and was bought from my favorite source for good quality, product knowledge, expert service, and competitive price – Dorota Hartwig at Southwestern Paint on Bissonnet near Kirby. (713) 520-6262 or dorotasouthwestern@hotmail.com. She is great at helping you find just the perfect paper! Discuss your project and make an appointment before heading over to see her. The home is in the Memorial-Dairy Ashford / Energy Corridor area of Houston. 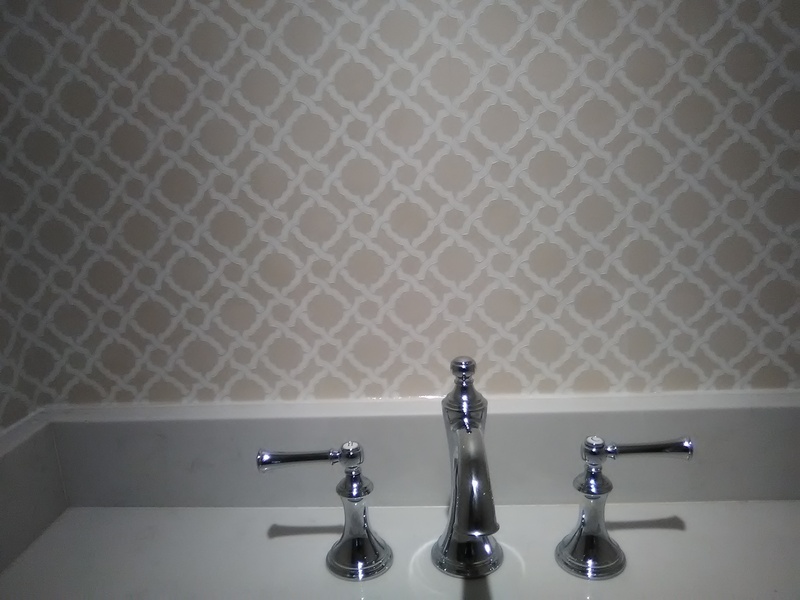 The color of this new wallpaper isn’t much different from the color it was painted originally. But the little bit of tone-on-tone pattern sure adds a lot of dimension and interest, while still maintaining a calm and serene feel. 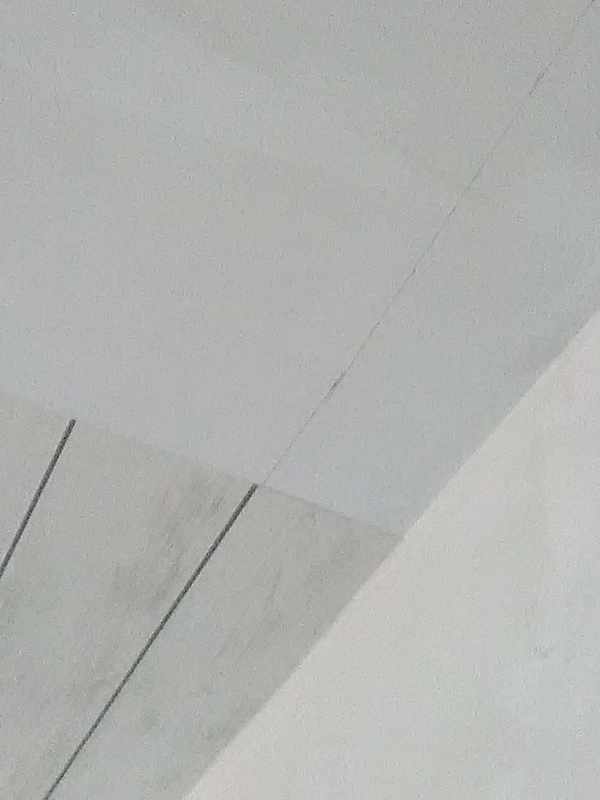 The homeowner wanted paper on the ceiling, too. 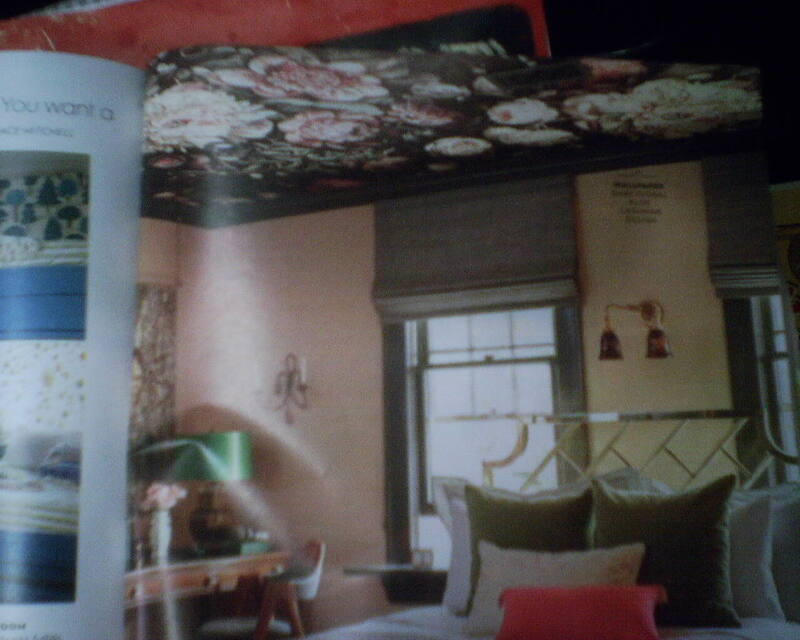 I usually don’t like pattern on the ceiling, but this one is so muted, I think it looks great. The home is located in the Galleria / Tanglewood area of Houston. 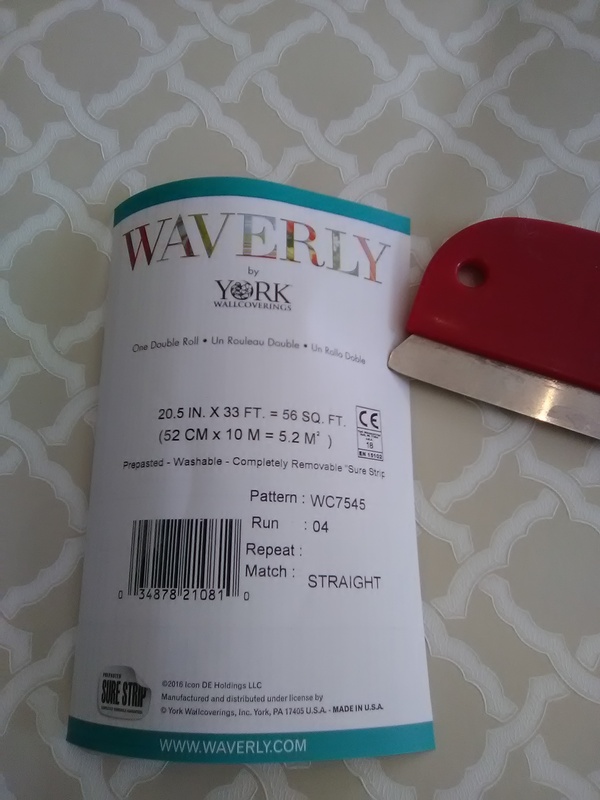 The paper is in the SureStrip line by York, in the Waverly design collection. It was nice to work with, and is thin and will hug the wall and stay nice and tight for years to come. The paper was bought from my favorite source for good quality, product knowledge, expert service, and competitive price – Dorota Hartwig at Southwestern Paint on Bissonnet near Kirby. (713) 520-6262 or dorotasouthwestern@hotmail.com. She is great at helping you find just the perfect paper! Discuss your project and make an appointment before heading over to see her. You’re looking at a section of crown molding. See that flakey stuff? That is the enamel paint on cracking and chipping off the woodwork. Why? When the original wallpaper was installed, some paste got on the crown molding. This is normal. 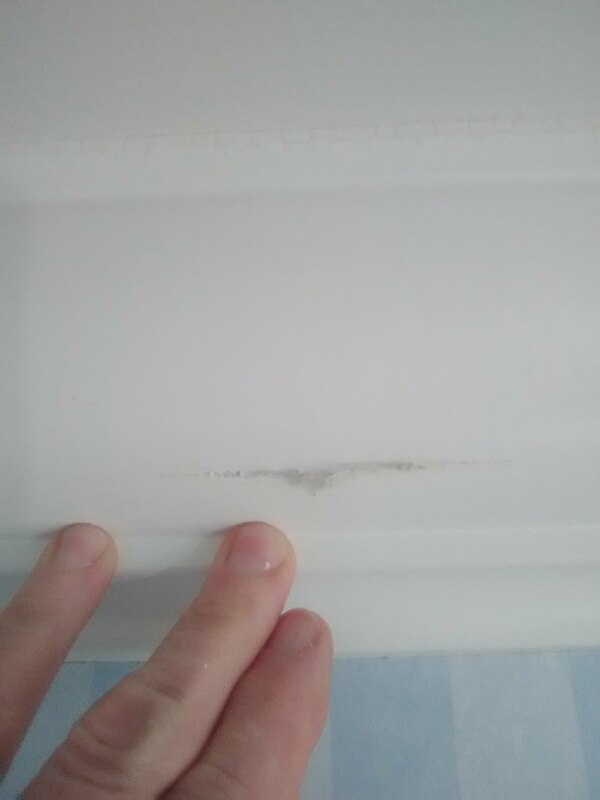 But in this case, the paperhanger didn’t wipe off all the residue (this can be hard to do, because it’s really hard to see). 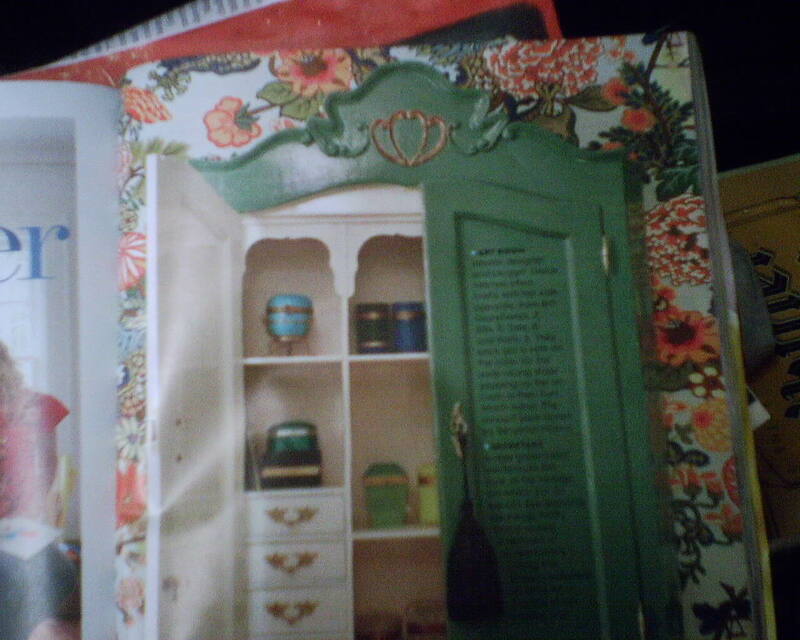 Over time, that paste residue ate into the paint and caused it to crackle and chip off the wood. This can be avoided by making sure that all paste residue is completely wiped off any painted surfaces. 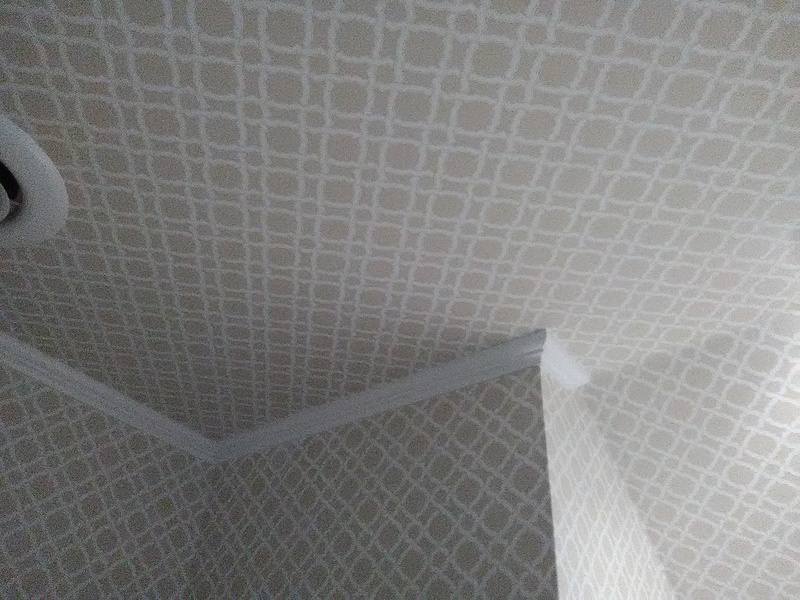 I like to use a thin blue plastic tape on the top edge of wallpaper, which keeps paste from coming in contact with the crown molding or ceiling. 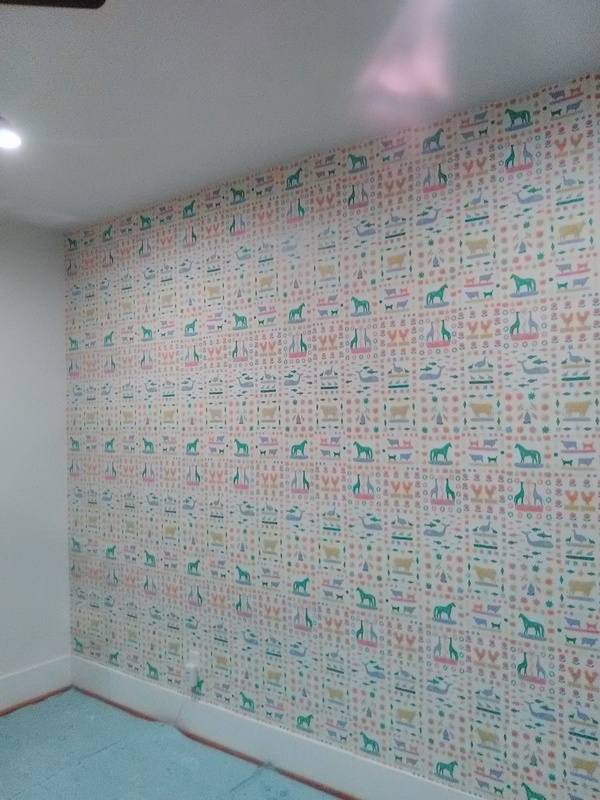 I plotted the layout of this pattern to have the leopards’ heads be at the top of the wall, just under the crown molding. This worked nicely for the first three walls. 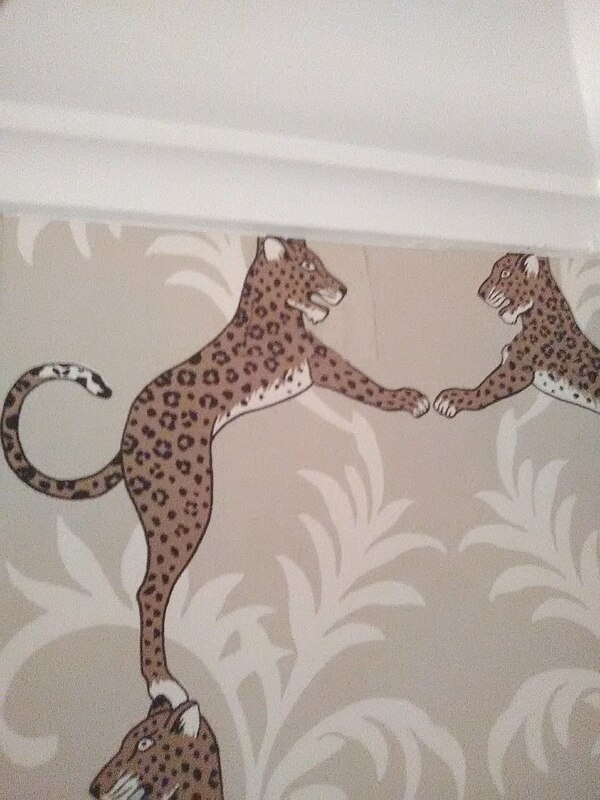 But due to unplumb walls and a very unlevel ceiling, as the wallpaper strips moved from left to right across the four subsequent walls, these poor leopards got their heads got cut off. I cut new intact heads from scrap wallpaper, and appliquéd them onto the cats’ chests. A little snipping and trimming was needed to get the various body parts to line up. The leopards’ necks are a little shorter than when they started out. But that is much less disagreeable than half-heads. 🙂 From 9′ down on the floor, all the eye can see is that the animals’ heads are lined up perfectly under the crown molding. 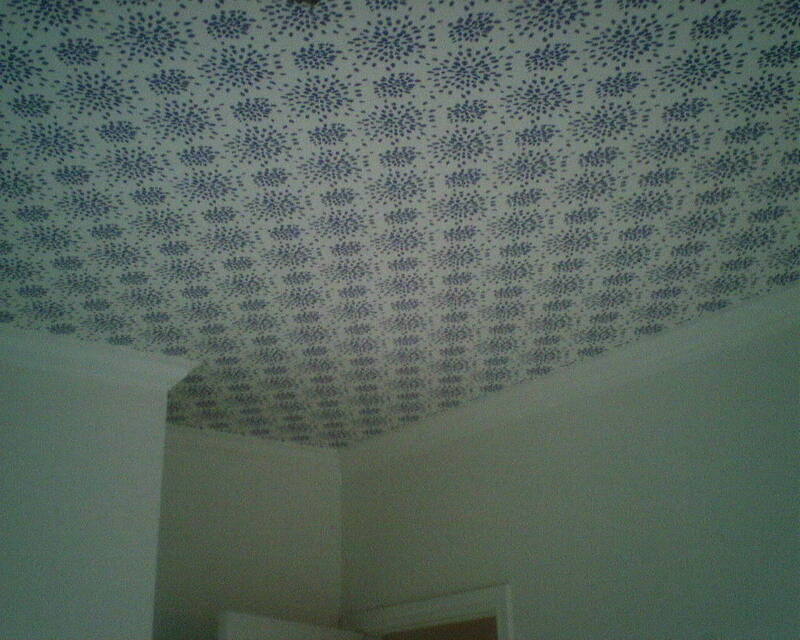 I don’t often hang wallpaper on ceilings. But every now and then I’ll take one on. Because I have neither scaffolding nor a helper, I’ve devised ways to defy gravity and get the paper up on the ceiling with minimal anguish. After the paper is pasted, I book it in several shorter accordion folds, instead of the traditional 3′ and 6′ split. I place two ladders facing one another. I get on one ladder, position the paper, then use push pins to hold it to the ceiling while I walk from the first ladder to the second. 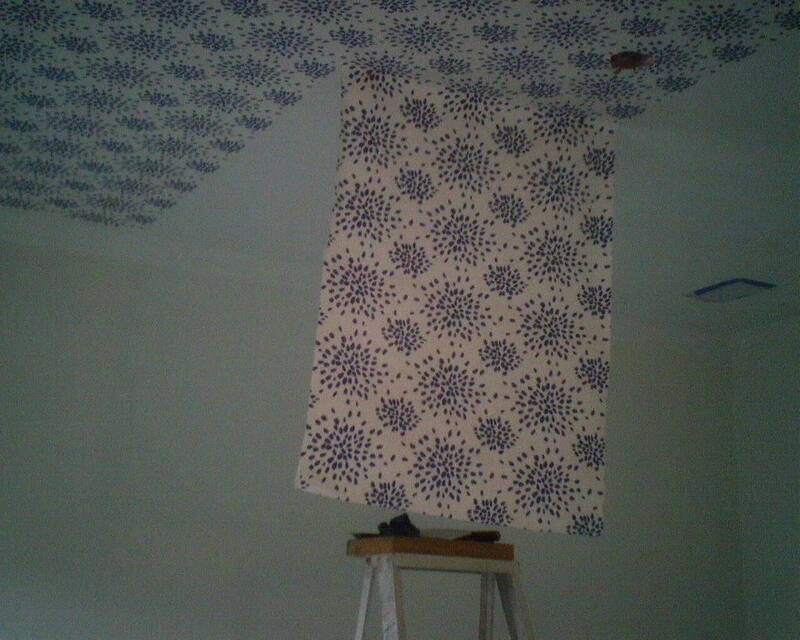 I smooth that paper into place, then use more push pins to hold it to the ceiling, climb down, move the ladder, climb back up, unbook one or two of the accordion folds of wallpaper, smooth it into place, tack it to the ceiling, climb off the ladder, move it, and repeat.